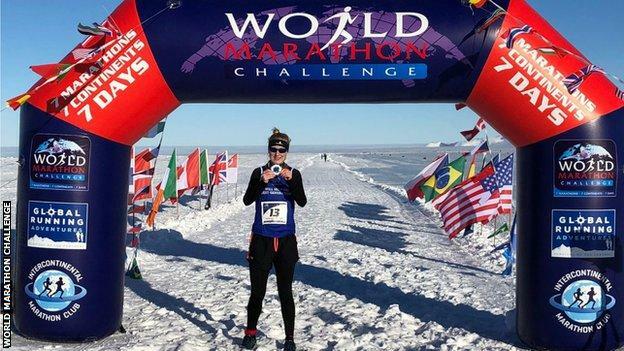 British runner Susannah Gill has won the World Marathon Challenge after completing seven marathons across seven continents in seven days. Gill ran the gruelling 295km (183 miles) in a world record time of 24 hours 19 minutes nine seconds, burning up to 5,000 calories a day. The 34-year-old ran the final race in Miami on Wednesday night in 3:26:24. “It was a crazy ambition that I wanted to do. The challenge seemed absolutely irresistible to me,” she told the BBC. 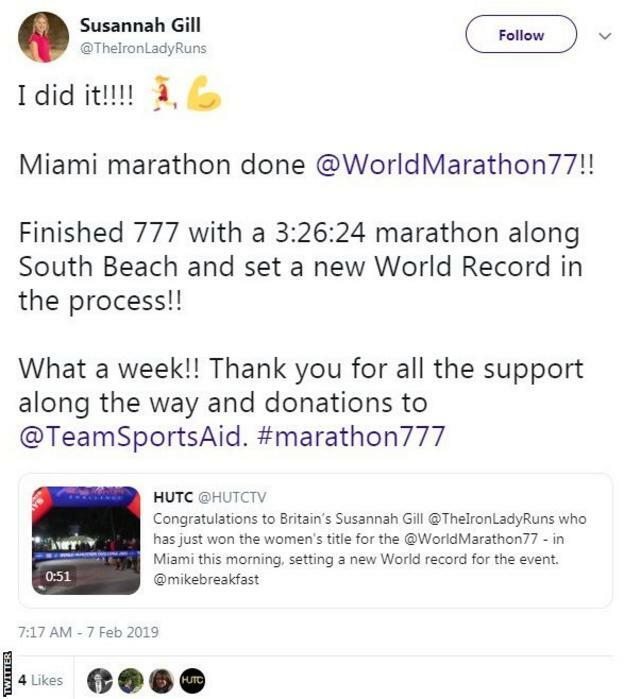 Over the past decade she has completed 45 marathons, including 10 London Marathons, with a fastest time of 2 hours 58 minutes. American Mike Wardian won the men’s title after completing the final marathon in Miami in 2:53:03 for a total time of 20:49:30 for the seven races. Gill finished second in the first marathon in Antarctica, but won each of the remaining six marathons – all run over the standard 26 miles 385 yards (42.2km) – on her way to overall victory. 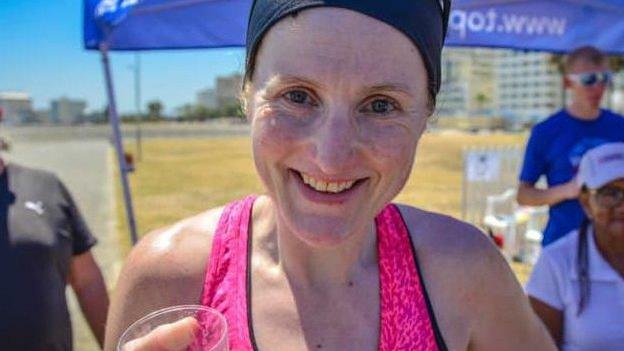 Competitors landed in Cape Town, South Africa on 29 January before travelling to Antarctica for the first marathon, where temperatures dropped as low as -35C. 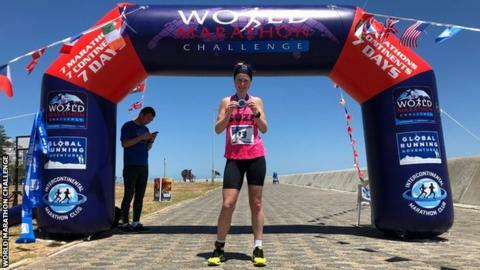 Just two days later in Perth, Western Australia – and having run a marathon in Cape Town the day before – Gill battled soaring temperatures of 35C. Competitors take in the sights of Nova in Antarctica, Cape Town, Perth, Dubai, Madrid, Santiago and Miami, flying more than 63 hours over 55,000 miles across the globe, providing vital time for rest and recovery in between marathons. “It’s been an extraordinary week. I’ve loved it but it’s been tough,” said Gill, a leading executive in British horse racing. “Although none of us have slept in a bed for a week, and we’ve probably never had more than three hours’ sleep at a time in a plane seat, strangely none of us want to go to bed because that means it’s all over. “It’s actually more fun to be here and support other runners and make sure everyone gets home and gets their medal, which is what it’s all about. “I was sporty at school,” said Gill, who went to school in Wiltshire and lives in London. “I remember the first time I was asked to run 800m and it felt like the longest run of my life. Ironically, it now takes me about eight miles to warm up,” added Gill, who has been raising money for the Sportsaid charity. “It really took off about 10 years ago; I’d had a couple of years in London and I really wanted to run the London Marathon, so I started to get fit, whether it was running outside or on the treadmill, and then once I’d done London [Marathon], I was just hooked on endorphins and the feeling of running marathons. “Rather than going for a nice run after work, I’ve been doing really, really hard training sessions and I’ve been a bit tired at times. “It’s been pretty much every weekday after work, and then a standard weekend was either a three-hour run on Saturday and a four-hour run on Sunday, or a three-hour run on Saturday and then go off and race a marathon on Sunday, which doesn’t really give you a lot of time to see friends and family very much, so I can be a bit more normal for a while now. 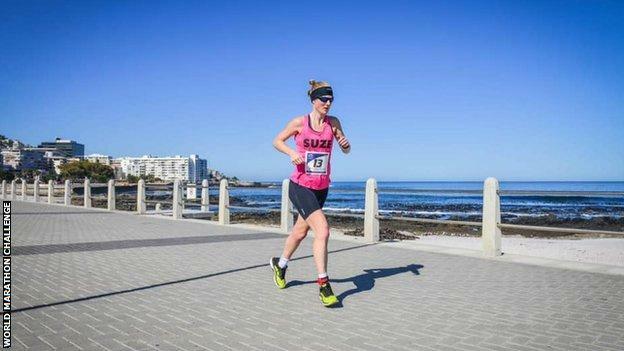 “I can go back to running just one marathon at a time which will be quite nice. “I think I’ve averaged about 3:28 to beat the existing female world record, which was 3:55 [per marathon]. I never thought I could string those sorts of performances together but I just got into a flow,” she said. “Races one to four were OK; five, six and seven have been really, really hard. I started to question whether it was such a good idea, but I got through it. “I’ll get back to normal life and put myself back together again because I’m sure I’ll have some aching muscles. “I’ve been all right on the blister front because I’ve done 10 years of marathon running, so they’re OK. It’s just the legs and the hamstrings down the back of the legs because they’ve done so much of the work; the last two or three marathons, they’ve been very, very sore.